Although Starbucks doesn't have an actual "secret menu," it's certainly no secret that your barista can make almost anything you want with the many ingredients they have on hand. Recently, this has given rise to colorful new creations on social media like the "Pink Drink" and, just last week, the beautiful "Purple Drink." But now, it looks like there's yet another bespoke beverage blowing up on Instagram: the "Orange Drink." 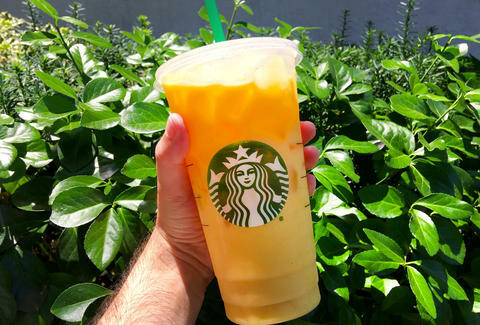 A Starbucks store manager in Southern California first revealed the recipe for the super-sweet drink in an interview with Foodbeast this weekend, and as evidenced by all the Instagram posts so far, people are already going crazy over it. After all, it's unlike anything you can order from Starbucks' official menu and almost as orange as your damn spray tan. Tony Merevick is Cities News Editor at Thrillist and is a little worried about all the sugar he just consumed. Send news tips to news@thrillist.com and follow him on Twitter @tonymerevick.